All the major FX platforms I track reported weak Oct volumes, with EBS leading the way down -17% drop in ADV to $80.6bn/day ($97.4bn/day in Sept). The fixed income landscape is very fragmented, at last count there were around 137 fixed income venues (according to John Greenan’s blog post). 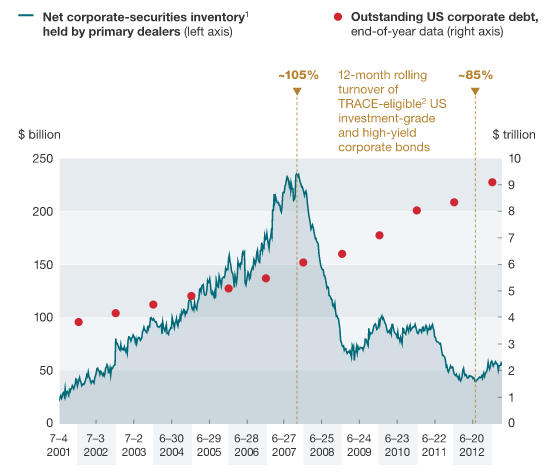 Reduced balance sheets due to Basel III, and lower leverage ratios have resulted in sell-side firms losing their ability and appetite to warehouse bond inventory, as a result liquidity has diffused and fragmented. The traditional way of sourcing and aggregating of liquidity from across fragmented liquidity pools doesn’t always work, especially in illiquid bond markets. Oliver Wyman see a reversal of fortunes for Wholesale Banks and Asset Managers. The effects of Quantitative Easing (QE) and bank regulation drove a more than $100BN divergence in revenues since 2011, with Asset Managers up $65BN and Wholesale Banks down $45BN. This now looks set to go into reverse. Asset Managers face growing fee pressures whereas Wholesale Banks will benefit from shifts in policy, technology, and operating leverage. But the gulf between winning and losing firms will widen in both Asset Management and Wholesale Banking. The major FX OTC platforms have now all reported their Sept volumes. After a slow summer, all the major platforms have reported strong rises in Sept, as shown in the table below. FastMatch lead the way with an impressive 28% increase to $20.8bn/day, whilst FX SpotStream posted a new all time high monthly ADV of $23.9bn/day. Although not a record in terms of monthly ADV, Reuters had a record day on September 27, with $619bn traded across the venue (which includes spot as well as FWD and Swaps on their SEF).